The best way to connect kitchen, often referred as a working zone of the house, with the living and dining room is to implement an open floor design. This is particularly useful when you have a small house – open floor plan is very effective in maximizing your space. When dealing with an open floor plan, each area’s functionality and decoration should be well balanced. Before hiring a professional interior designer, you should try to design it yourself having in mind following tips. Set the tone. Before doing anything with the space, you need to set the tone of the space you are decorating. Being all hands on on your interior can get overwhelming, which then leads to various styles, colors and designs being mixed up. Once you’ve decided what you want to accomplish, all further doings flow easily. Differentiate the areas in open floor plan. It is of major importance to distinguish every area, by the pieces of furniture, for example, so it’s obvious in which zone you are. Armchair and couch tells that you are in the living room. Dining table and chairs are clear furniture elements pointing to the dining room. You can always use other things to divide the space, like folding screen dividers, or even pieces of furniture like commodes and other. Pick the right color flow. Choosing the right color palette to express yourself is one of the starting points of any design. When you choose the right color palette you have to stick with it throughout the whole open floor. Add some artwork details according to your personal preferences. Accented vertical lines in some other color can also be the way to separate areas of the existing open floor plan. You can also use wall stickers or painted decorations on the walls as dividers. Yet, it’s important you don’t go crazy and make the room a circus – no matter how much you with to achieve separate rooms effect, you still need to stay homogenous in your choices. It would be bad to decorate one wall with, say, floral wallpaper while decorating the one next to it with stripes. However, leaving florals on one wall and painting the wall next to it the same color shade as wallpapers is a pretty good option. Let there be light! Every part of the open floor plan that you want to decorate requires different lightening according to its purpose. Using bright lights for kitchen is only logical. 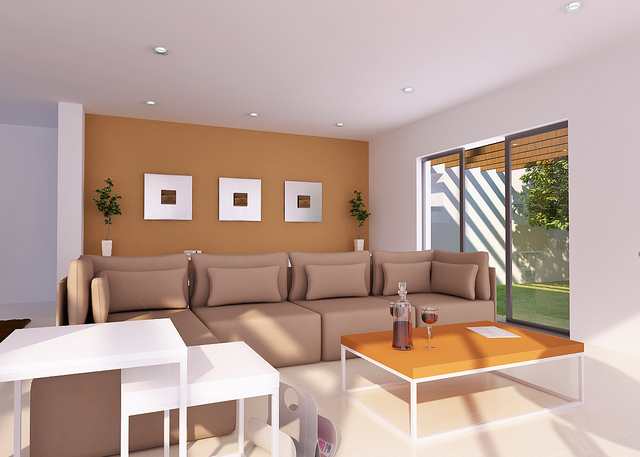 Hidden lights with dimmers can make the living room atmosphere more comfortable. Type of lightening elements used also distinguishes areas from one another. Use dividers. When you are operating with a space with no walls, you need to get creative. You can use furniture as a divider (for instance, putting sofa bed in such a way to face kitchen with its back part is sufficient enough to make a division between your kitchen area and living-room area. Or, you can buy actual dividers and play with them. They have a mistiqy look which will give a special tone to your space. 3) Living room – This is the part of your house that’s supposed to be a place to relax at. 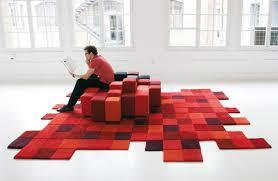 Therefore, you should opt for a quality rug that’ll go with the décor of that space. Most commonly, placing a rug under the coffee table is the best thing to do. Floor rugs have proven to be a great option – they are soft and easy to maintain. Don’t forget that carpets and rugs are also a great way to set the tone of a certain space so, when buying them – make sure they fit into the rest of the space. Open floors seem tricky to handle, yet with the right tips you can do anything! We hope we helped!